Experience history in a traditional department store – since 1937! Southern Lady (missy to plus sizes), footwear (New Balance, Nike, Stacy Adams, work boots, etc. ), lingerie, Levi’s, Wrangler, Carhartt, baby & shower gifts and more! Greetings from Colorado….I was wondering: How did the store get its name? Hi, Neal from Colorado! If memory serves, the Black & White Department Stores were once a chain. The one in Yazoo City is the only one still in existence, though it is has been privately owned (not a part of the old chain) for a long time now. Just Curious, do you know who first owned the store by this name and in what year? I’m researching maternal line of my family. I’m not sure who that would have been, Traci. I would recommend calling the Ricks Memorial Library (662-746-5557) and ask for Sue Patterson. She is President of the Yazoo Historical Society, a genealogist, and volunteers at the Library one day a week. If I remember correctly Loius Price was first owner. Bernard Fink later owned it for years, and current owner Jimmy Chisolm has been there for over 50 years. 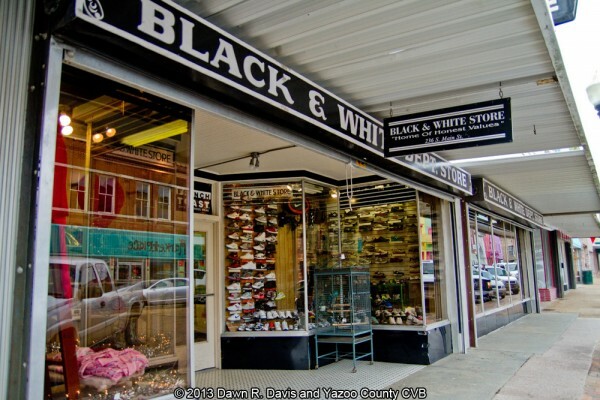 We wanted to be sure to connect with you before too much more time passes just to say how very much we enjoyed meeting your family and our time at the Black & White Store! We’re having a grand adventure meeting people all over your state (as well as Tennessee & Alabama too). We tried sending one of the photos we took but it bounced back. After we’re home, we’ll try it again from a regular computer. Larry is looking quite dashing all over the south in your hats! Ron & Karen Jones from Kidderminster Worcestershire England. You all thought we were Australians!! We called into the Black and White store in October 2017. Loved meeting all the locals in Yazoo. Did Martha ever book her trip to London?